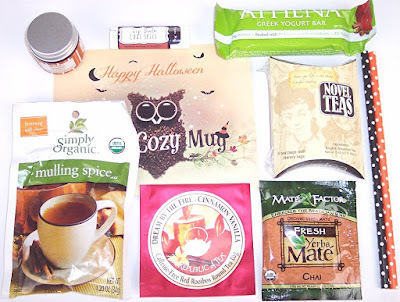 Japan Crate Review, November 2015 + FREE Mini Crate and/or $3 Discount! Perhaps the greatest service performed by subscription box companies is the introduction to aspects of other cultures that would not otherwise be available. That was certainly the case with South Korean beauty products which have exploded into the U.S. market over the past few years. The same might be said of candy and snacks from Japan although Amazon has definitely played a role in elevating those items to the worldwide audience. Japanese snacks are all over the place; by now, who hasn't at least heard of companies like Glico, Morinaga and Meiji? If you haven't yet tried Pocky, well, you're just missing out on one of life's guilty little pleasures. Even if you can't read anything on the package....if it comes from Japan, it will probably be fun, tasty and something you haven't tried before. One sub box that is devoted solely to Japanese candies and snacks is Japan Crate. Each of these can be purchased by the month or for progressive discounts for three, six or twelve month terms. The boxes contain a crazy assortment of candy, snacks and DIY kits from Japan. For the most part, these are candies that cannot be found in the U.S.
My first Japan Crate arrived in a bright red box about two weeks after placing the order. This is the Original size box. Inside is a riot of color, fun and wackiness. There is even a full color mini magazine with all sorts of fun information, cartoons, DIY candy instructions and a two page diagram showing what items came in each size box. This is the most elaborate information brochure I've ever received in a subscription box. I had to rely completely on the book for this package of Purple Sweet Potato Sticks from Glico. These are wheat cracker sticks made with purple sweet potatoes which are a seasonal treat in Japan. Hmmm...they look a lot like Pocky to me. There are three packages of Black Thunder from Choco Bar Japan. The name is inspired by the Japanese god of thunder. They are made of cookie pieces and rice puffs and covered in dark chocolate. Nothing not to love there! From what I've read, do it yourself candy and snack kits are completely silly, but a necessity in any authentic Japanese snack box. This one is called the Funassyi Furi-Furi Shake DIY Kit. (Funassyi is a popular Japanese mascot cartoon character.) When mixed with a cup of milk and an ice cube, you end up with a pear flavored milkshake. The kit includes a cup with lid, sachet and straw. This colorful little box holds "Uranai-kko Bubble Gum" or soft bubble gum sticks. More cuteness...each stick contains a fortune, translations of which can be found on Japan Crate's blog. From Glico is a box of Hot Chili Salad Flavored Pretz, baked snack sticks. Uh, Dorothy, we are definitely not in Kansas anymore! More weirdness...Glico Man Caramel & Toy. This is actually two boxes shrink wrapped together. One contains individually wrapped heart-shaped caramels and in the other is a three piece rocket-shaped toy. What these have to do with each other (or the victorious athlete on the red box for that matter) is a mystery to me but the toy is much better quality than what you might get in a box of Crackerjacks. Meiji is an old Japanese candy brand and these meticulously packaged caramels are made to look like five different dice. (The dots on the dice are on the sides.) Inside each one is a caramel. Who thinks this stuff up? Finally, there is a box of Pejoy Cookies & Cream Biscuit Sticks. In my opinion, the best Japanese snacks are the various filled and dipped cookie-like sticks because they are so light, tasty and easy to eat. It seems strange that this idea hasn't been copied by any U.S. candy manufacturer. That's it for November's Japan Crate. This was such a fun box to go through and share. I really enjoy the Japanese take on snacks which is clearly quite different than what we are accustomed to in the U.S. Fortunately, these snacks are increasingly making their way onto Amazon where they can be purchased individually if you find something you really like. I haven't been able to find any discount codes for Japan Crate but they have a nice Black Friday deal going on at the moment. Get a free Mini Crate with code DAIFUKU when you purchase any subscription or gift. Also, you can pick up a $3 discount code by signing up for their mailing list (scroll all the way down to the bottom if you don't get a pop-up). P.S. In case you're wondering how to say "bubblegum" in Japanese, it's "Fuusengamu". You're welcome! BookCase Club Review, November 2015 + 10% Discount Codes! It's not that I don't have enough books to read. In fact, quite the opposite. My collection is really an embarrassment of riches with shelves and floors overflowing with books waiting to be read. But there's just something irresistible about getting a mystery book box in the mail, especially when you have the opportunity to choose the genre. Shipping for all plans is $5.00 per case. The books are shipped on the first day of each month, regardless of when you sign up. You are re-billed on the tenth of each month. The BookCase is shipped via USPS Media mail. Inside were two books and a charming welcome note from "Katie". I'm not sure if this is really hand written but it sure does look like it. Both of the books I received are brand new hardcovers with dust jackets. The number lines on the copyright pages indicate that these are first editions but "First Edition" is not specifically stated, so I'm not sure about that. One of the books has a black remainder mark across the bottom of the pages. The first book is "Seven For A Secret" by Lyndsay Faye, published 2013, 442 pages, retail price $26.95. I am not familiar with this author but the Civil War era plot involving slavery and police corruption is intriguing. Although I've maintained a disciplined reading log for the past eleven years, it doesn't include a single Stephen King title. I KNOW I've read Stephen King novels but the last one must have been many years ago. So I was glad to see this Stephen King title, "Mr. Mercedes", published in 2014, 436 pages, retail price $30.00. How can your eye NOT be drawn to a book cover dripping in blood? The jacket blurb says "In a mega-stakes, high-suspense race against time, three unlikely and winning heroes try to stop a crazy killer from blowing up thousands". This plot sounds like an eerily familiar juxtaposition of the recent massacre in Paris and the three American heroes who thwarted the terrorist attempt on a Paris-bound train this past August. I'm sure that's just a coincidence, but it certainly got my attention. I'm not sure just how much personal curation goes into BookCase Club boxes but these two books clearly fit the genre I chose. They are the type of books I might pick up in a book store and the fact that they both have great dust jacket art doesn't hurt. (Yes, I am shallow like that.) The mix of one well known author and one lesser known author also appeals to me. To get a 10% discount on your BookCase Club order, use codes bookwarehouse or cratejoy during checkout. I am guessing true book lovers will have as little restraint as I did with respect to this box and that's not a bad thing. Fortune Cookie Soap Box Review, Winter 2015 + $5 Store Discount! The theme of Fortune Cookie Soap's Winter 2015 Soap Box is "Welcome Santa!" with lots of cute Buddy the Elf graphics. (They are careful to not quite cross the licensing line!) This fun quarterly subscription box is known for its offbeat (sometimes downright risque) sense of humor and creativity in both products and packaging. The Soap Box is filled with eight miniature bath and body samples. The boxes are designed to coincide with major Fortune Cookie Soap product launches. The Soap Box is $19.99 in the U.S. or $28.00 for Canada. Boxes arrive by USPS first class mail and are about 6.5" square. The blue and white crinkle shreds and the candy cane immediately set the cool holiday tone for this box. The information card in The Soap Box is important because the samples are so tiny that the writing on them is often indecipherable without magnification (to my feeble eyes anyway). Also, some of the products have no information at all on them so the card is essential for figuring out what they are. It is a bit of an annoyance to have to keep the card until all the samples are used but I'd rather have it than not. A perfect example of why you need to hang on to the information card are these little white pellets with sprinkles of lavender. Would you have ANY idea what to do with them? The card identifies them as Christmas Gram - Face Plant, cute...but not helpful. Turns out these are for steaming your face. Drop a couple in a bowl of hot water, put a towel over your head and the bowl and let the steam refresh and open your pores. The candy cane is self explanatory, n'est ce pas? This adorable little white shaker bottle contains Cotton Headed Ninny Muggins. You know EXACTLY what that is, right? RIGHT? I told you FCS was creative! This is a dry shampoo with a light floral scent. Dry shampoos aren't my thing but this diminutive container is so cute, I might have to change my policy just this once. Every Soap Box contains a signature Fortune Cookie Soap. This one is a bright Christmas green complete with red pompom. It is called "Buddy" and has notes of holiday fruits, candy, vanilla and a hint of mint. The fortune slip inside says "I'm a cotton-headed ninny-muggins". Uh....o.k. This little bath bomb is called Yellow Snow...typical FCS humor. Sounds a little dicey but it actually has a blissful blend of plums, whipped caramel, vanilla jasmine, exotic woods and a hint of Mandarin orange. Not what you thought, I bet! This little dropper bottle contains Shower Duet Shave Oil. This is a blend of spruce and vanilla, fir and fruits and hyacinth and mint. The card says to massage a few drops into the area to be shaved; the oils soften hair and skin. Hand sanitizer is a product I don't use much but every single Soap Box contains one. This time it's "Swirly Twirly Gumdrops", a sweet and whimsical blend of cotton candy, lemon drops, pear nectar, cranberries and black currants. These do make great stocking stuffers. This cute spray bottle contains a perfume oil called FCS Cheer. This has a wonderful holiday scent that combines vanilla, frankincense, patchouli, and cedar. Nice little purse size too! Last is my favorite product which is called "World's Best Cup of Coffee". This is one of the FCS signature Whipped Cream blends which contains a bit of fresh brewed coffee and Vermont maple syrup. I love coffee scented bath and body products and this one is light enough to blend right in with no strong residual smell. I've finally come to terms with the tiny little samples you get in the Soap Box. They are, of course, designed to tempt you with the full sizes available on Fortune Cookie Soap's site. The current products tend to sell out very quickly so if you're interested, get on their mailing list so you'll be in the know when new products are released. The next available Soap Box is the Spring Box. That seems like a LONG time away but these boxes sell out quickly so sign up now if you're interested. The Soap Boxes are among the very earliest of the quarterly sub boxes to ship. For the last two years, the Spring box shipped in mid February which is (shockingly) just not that far away. For a discount of $5 off an order of $30 or more, click here. There's a lot packed into this little box and you just might pick up some cool gift ideas. It's probably safe to say that most box bloggers entertain the fantasy of curating their own box. I know a couple who have actually done so. Keeping economic reality in mind, my under $20 box would look something like The Cozy Mug. With this subscription, you get tea samples from various sources plus a few surprise treats like cookies, chocolates or beauty products. The idea is to promote a little "you time" with relaxing cups of tea and a few other niceties each month. New subscribers get their first box the month after they pay. That means you could actually get charged twice before seeing your first box. That's what happened with me as I signed up near the end of one month. My first box arrived early in the month FOLLOWING the next month...quite a long wait. 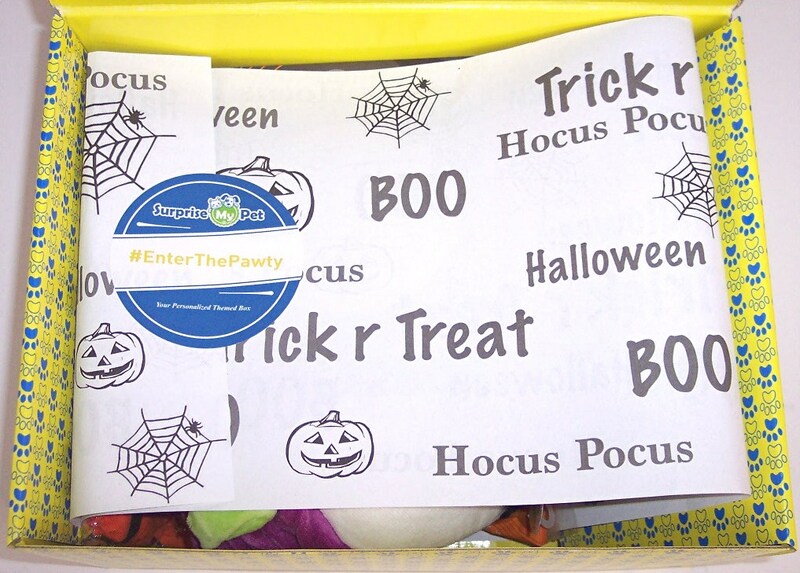 I received a small USPS Priority mail box which opened to reveal several Halloween-ish shades of tissue paper and a pumpkin sticker holding it all together. Some of the items were individually wrapped which gave this a real "gift from a friend" feel. 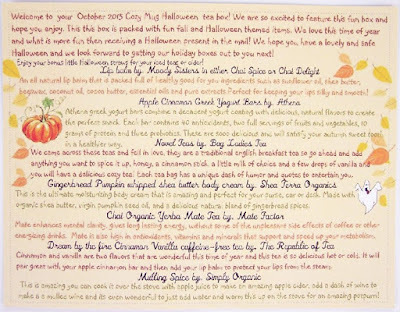 The information card is a little hard to read but very cute and seasonal; it tells why each product was chosen and gives tips about how it can be used. 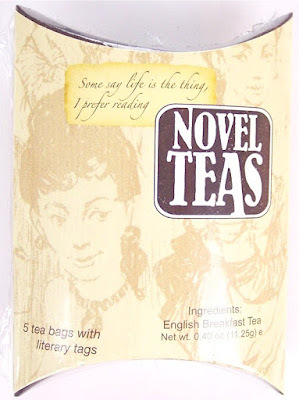 First is a cute little packet from Novel Teas which contains five tea bags. This is English Breakfast Tea; the card mentions that this tea is good for add-ins like cinnamon sticks, honey or vanilla. I plan to try a cinnamon stick since I have a bunch laying around and never know what to do with them. 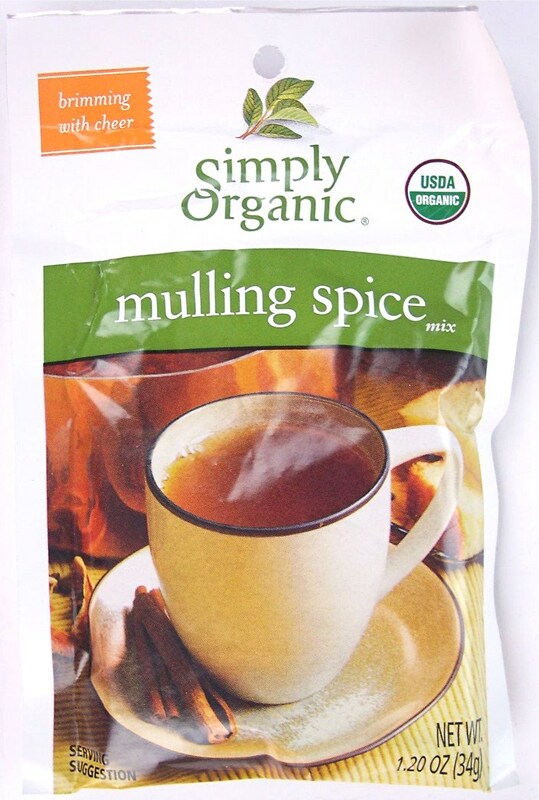 Next is a Mulling Spice mix from Simply Organic. Add this to apple juice, boil it, then strain out the spices for a delicious fall/winter drink. When it's cold out, I sometimes just boil mulling spices for the aroma rather than to drink. 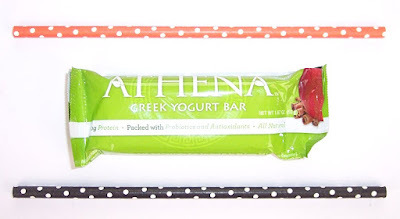 There are a couple of Halloween inspired sturdy paper straws and an Apple Cinnamon Greek Yogurt Bar from Athena. 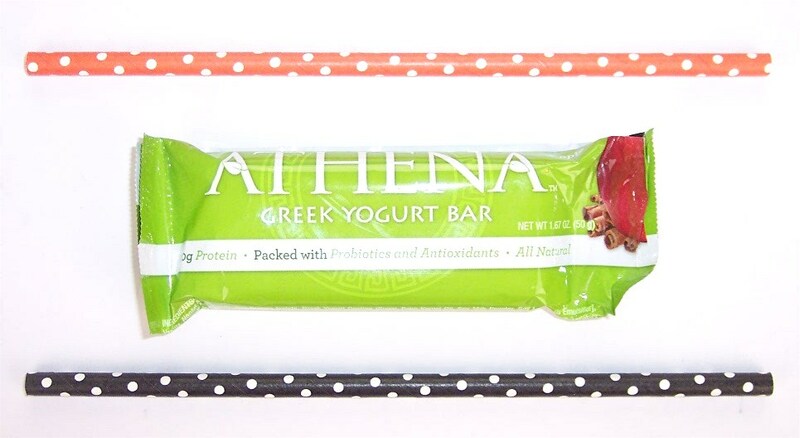 These bars contain a lot of good things like anti-oxidants, two full servings of fruits and vegetables, protein and probiotics. Plus, they just taste good. 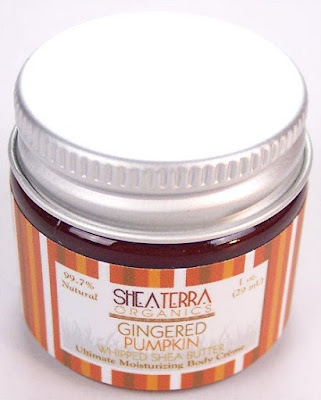 I've been introduced to Shea Terra Organics products through other subscription boxes so am always intrigued to get these in new seasonal scents. This is a generous sample size of their whipped shea body butter cream in Gingerbread Pumpkin. Smells like the real thing! People complain about getting too many lip balms in subscription boxes but they are always welcome in my mailbox. I use them constantly and gift any surplus. 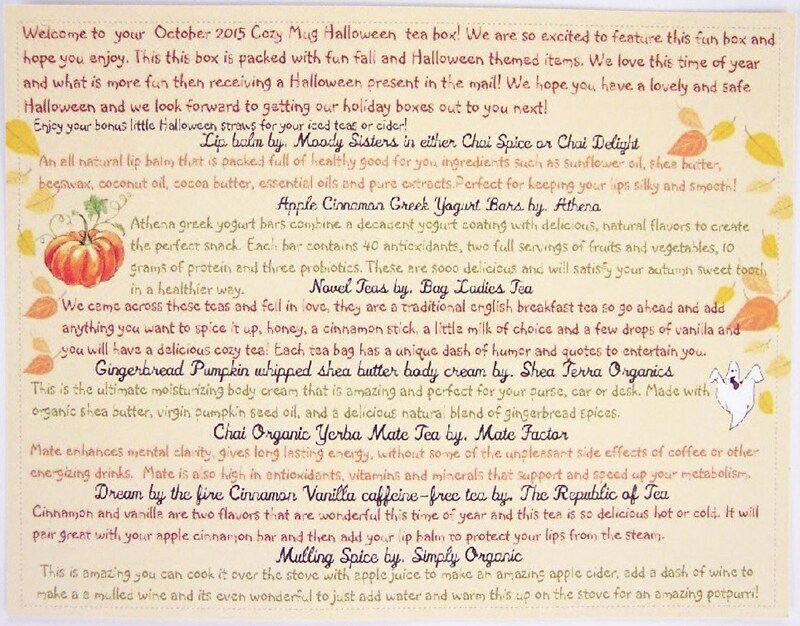 This one is by Moody Sisters in Chai Spice, another great fall scent which is already in use. 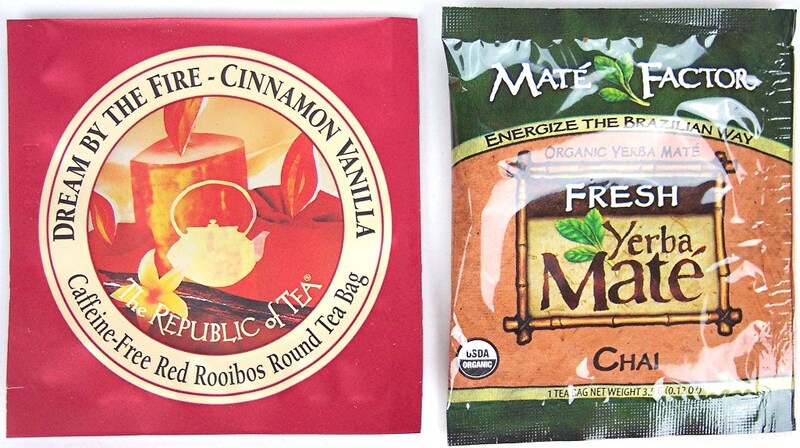 Speaking of Chai, there is a Fresh Yerba Mate tea sample from Mate Factor in that flavor and another from The Republic of Tea (one of my favorites) in Dream By the Fire--Cinnamon Vanilla. Digging into this box was fun; it felt like a gift from someone who knows me pretty well. Since we lost Eco Emi in April of this year, I'm not sure anyone has taken on individual packaging inside a sub box so I thought that was a very nice touch. Also, the seasonal curation really enhanced this box and tied it all together in a cohesive way. 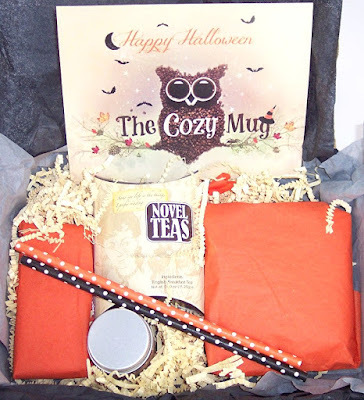 The Cozy Mug would make a great one time gift as well as a subscription for yourself, particularly at this time of year. I noticed that they have a few Halloween boxes still available if you want to collect any of the above products. Otherwise, new subscribers will get the Christmas box which comes out later this month. Until then, I will be busy brewing tea, mulling spices and slathering on Shea Terra products! 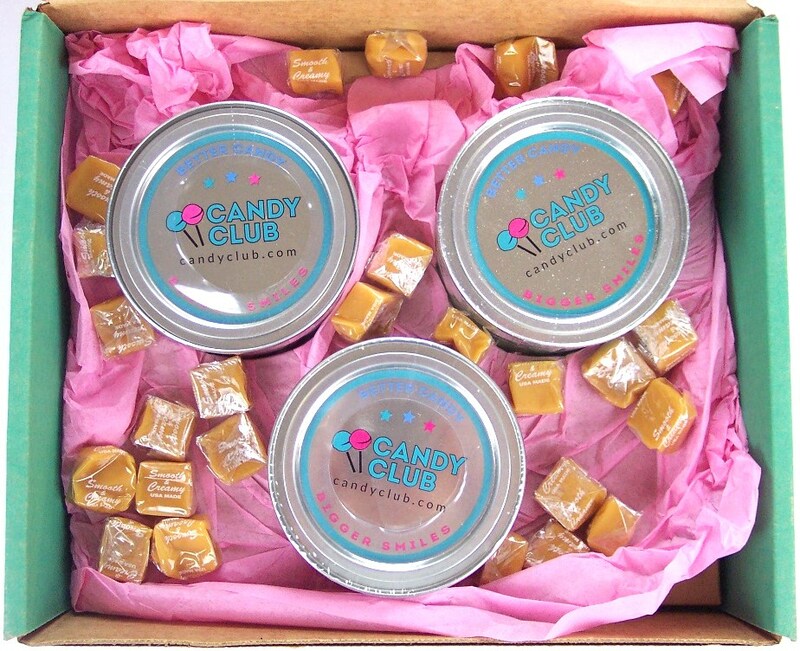 Candy Club Review, October 2015 + $20 First Box Discount Codes! Can you stand one more candy review? I'm just coming to the end of a Candy Club subscription so this may be my last one for a while. 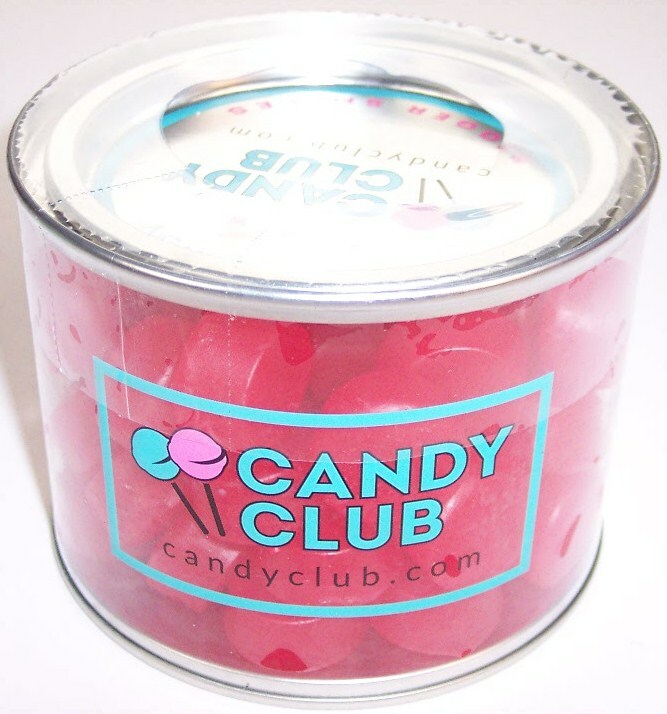 With their custom packaging, Candy Club does a beautiful job of presentation and they always come up with interesting new candies. However, their emphasis during the term of my subscription has been on sour candies, which are really not my favorite. Since most of this candy gets gifted, I'm sure the recipients would like to see less sour candy as well! Like many subscriptions, there are significant discounts for longer terms. A monthly shipment is $27.99, a six month commitment gets the monthly rate down to $22.99 and an annual plan gets the lowest rate of all, which is $19.99. There is a flat shipping charge of $6.00 per box, regardless of plan. Each box contains three of their signature containers plus a very generous handful of loose candy. 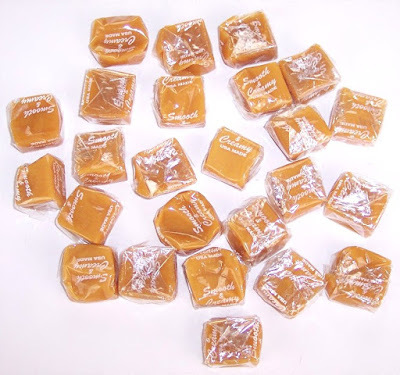 This month, the loose candies are individually wrapped caramels. 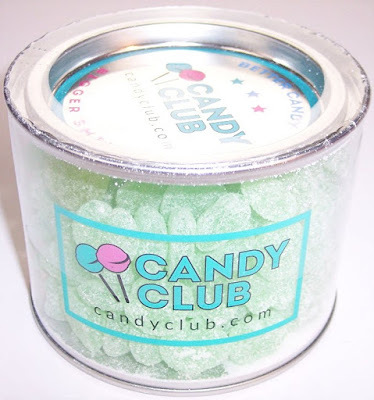 I've helped myself to a few and they are really soft and delicious, probably my favorite of all the loose candies Candy Club has sent. Since these candy containers will be going to others, I have not opened them. Hopefully, the photos will give a pretty good idea of what's inside though. The first candy is Gimbal's Cherry Soft Chews. I thought I'd received these before but I'm pretty sure those were sour, which these (thankfully) are not. This round disc shape is pretty common for Candy Club but the flavors can be vastly different. Next are Sour Patch Green Apple Gummies from Mondelez. They have a very fine sugar coating which should offset the sour apple flavor. And they are pretty! The third container holds Gimbal's Gourmet Jelly Beans in flavors that include wild cherry, tangerine, green apple and pink grapefruit. Since these are not sour, Santa may keep them for him/her self! 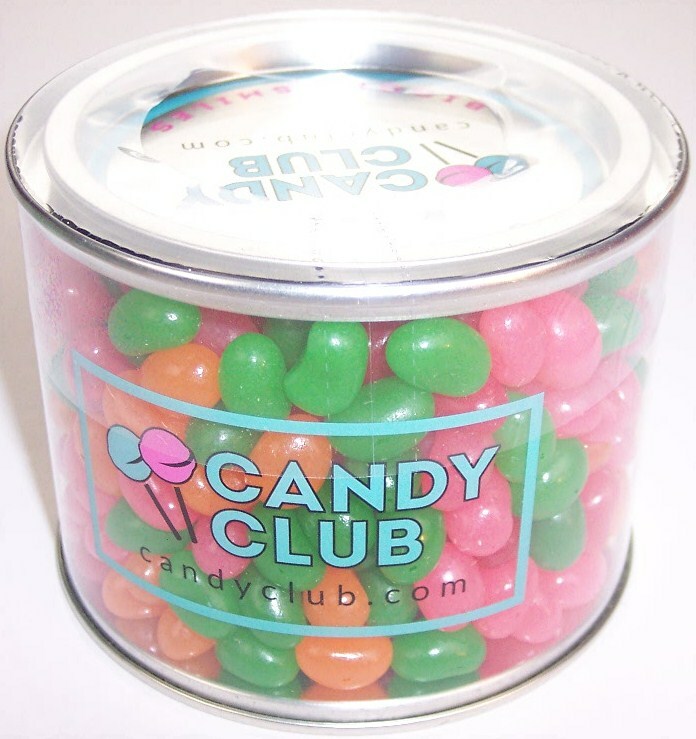 If you're interested in trying Candy Club, there is a $20 discount link on their Facebook page that is good through November 10th. If you miss that, there are usually discount codes around for $20 off your first box. Try scary-p, wonder-p, swnso-p, apples-p or just Google "Candy Club Discount Code" for current codes. It's been fun Candy Club! 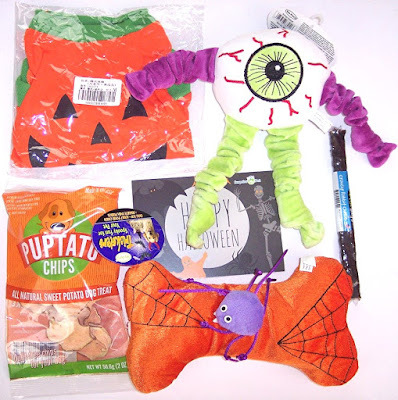 Surprise My Pet Review, October 2015 + 10% Discount! My pup Tucker and I recently discovered a new dog sub box called Surprise My Pet. After a little negotiation, it was agreed that I would pay for the box and he would model the included costume. As the photos attest, this was a grudging compromise but the payoff (treats) got his cooperation. Surprise My Pet is $25 a month with discounts for longer term subscriptions; however, there is currently a great Groupon deal where the first box is just $12.99. When signing up, you can choose your dog's size (less than 10 lbs., 10-20 lbs., 20 to 50 lbs. or 50+ lbs.) so that the box can be customized for your dog. Each box contains 4 to 6 toys and treats. The treats are mostly natural and organic and a portion of the proceeds goes to dog charities. Boxes ship on the 24th of each month. This cheery yellow branded box with a paw print pattern arrived by USPS Priority mail 17 days after placing the order. Under the lid, the goods were wrapped in Halloween themed paper...clearly, we were in for some treats. The box held a doggie Halloween costume, two toys and one treat. 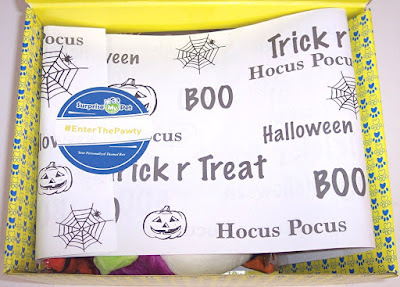 The card has a "Happy Halloween" graphic on one side and this very strange little pet "play" about a dog and cat trick or treating on the other side. This cute bone squeaker toy is bright orange and made of a soft velour type material. 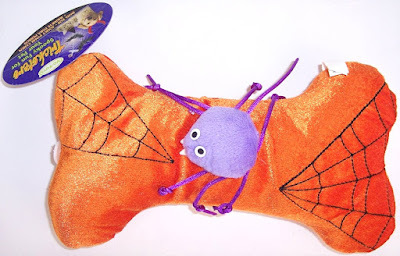 Spider webs are embroidered on each side and there's a stuffed purple spider attached to the center. As I've mentioned before, Tucker values things he can chew or chase. Crunchy rabbit chews are one of his favorite treats. This will be reserved for a very special after dinner indulgence. I have no doubt Tucker can burn through this in less than 10 minutes. 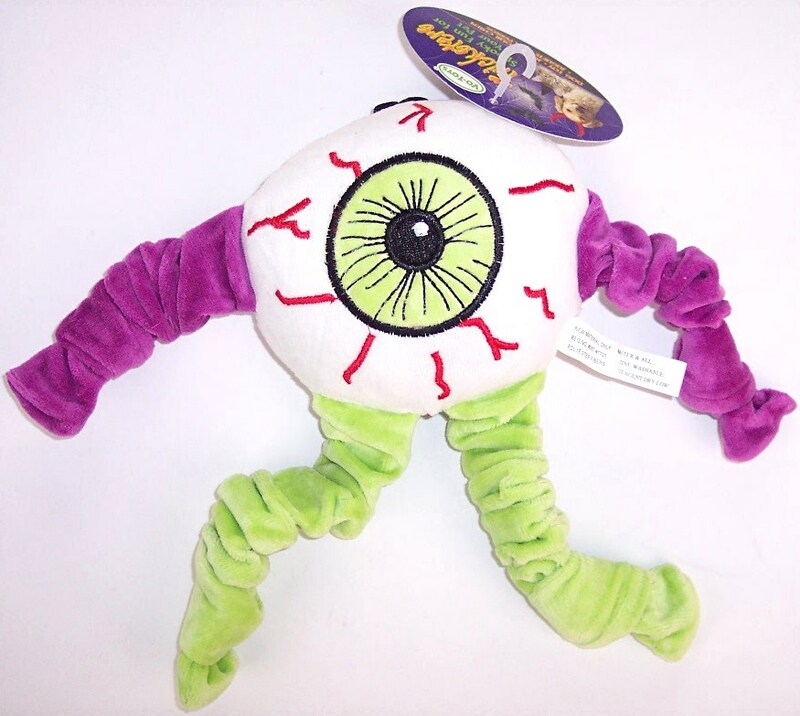 What pup could resist a giant stuffed bloodshot eyeball with bouncy legs? The squeaker inside this thing is HUGE! It will also make a great throw toy. Seems like every dog box this year has contained sweet potato based treats. 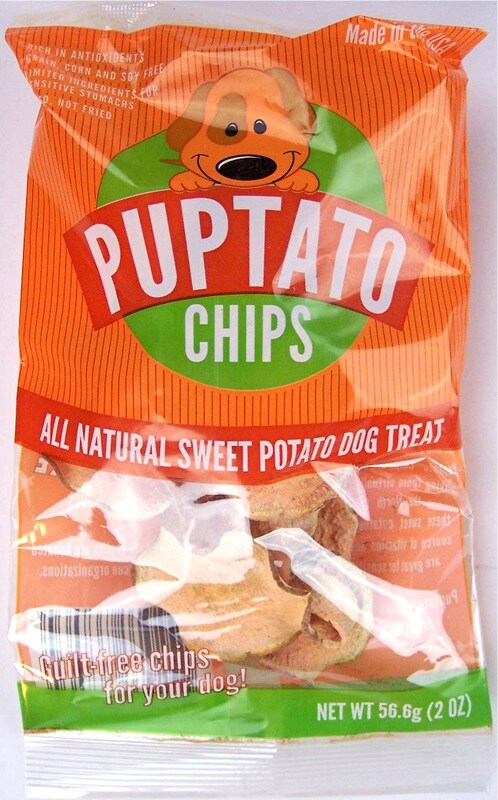 These are called Puptato Chips. I think Tucker will like these but I'm a little worried as he rejected the last big bag of sweet potato treats he received. Not sure what makes him gobble some and refuse others. 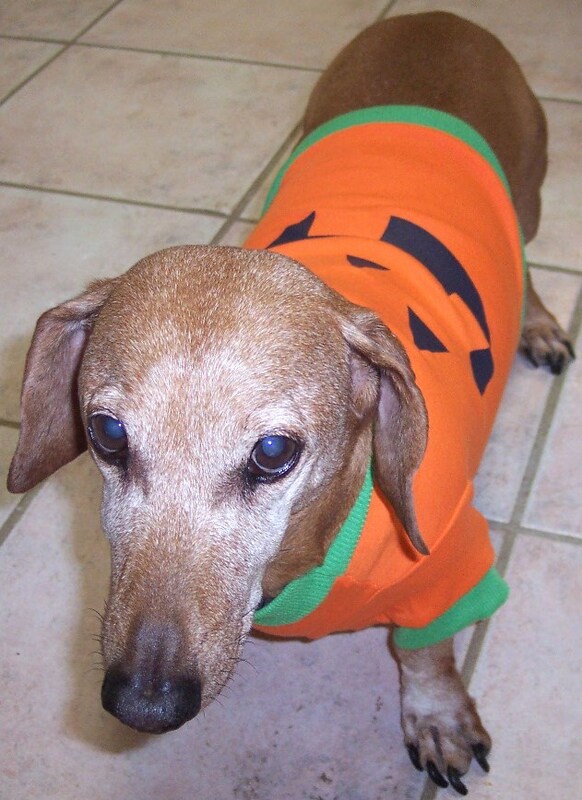 The FAQ's on Surprise My Pet's site indicate that costumes are often included in their boxes. If so, that is the main thing that will distinguish them from other pet boxes. 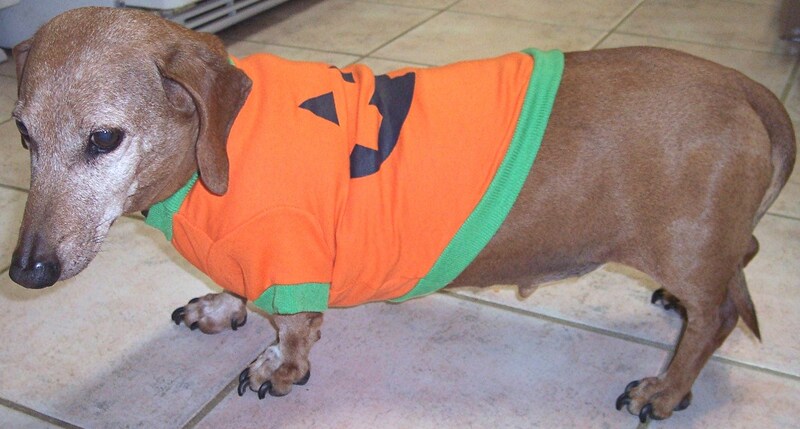 This time we got a cute pumpkin costume. It's a tight fit on Tucker so there's no way it would fit a larger dog in his weight range. (He weighs 24 lbs. which puts him in the "Medium" size range of 20 to 50 lbs.) As you can see, more of him is outside the costume than in it but he was a good sport! "....the things I do for you..."
Despite the expression, Tucker is a great trick or treater. Our neighborhood gets hundreds of kids every Halloween and he loves standing out in the street in his costume and greeting them, especially the littlest kids! It's amazing to see the instant bond that occurs when he meets a person who is not much bigger than he is. 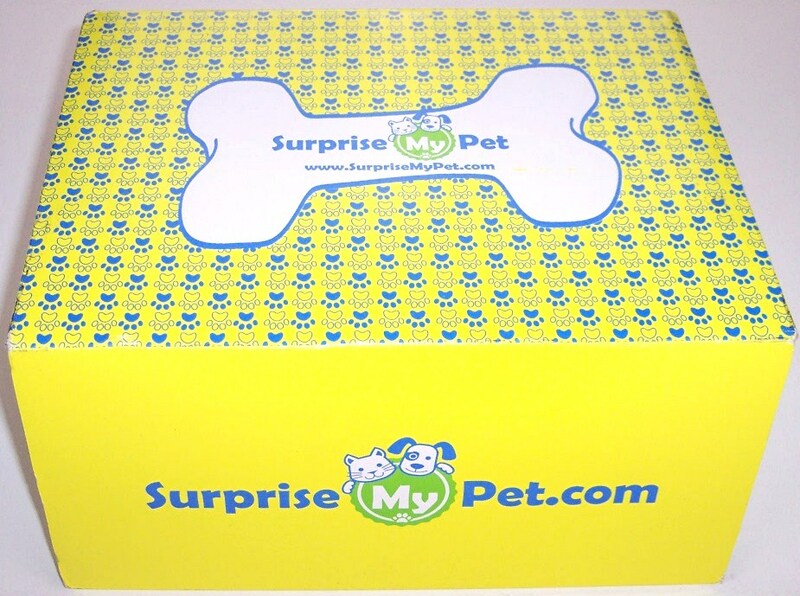 Surprise My Pet is a fun dog subscription with quality toys and treats. If you and your pup want to check them out, click here for a 10% discount on your order. If you're ready to commit to the annual plan, the code PUPSRULE will get $25 off the total price. I am not sure how much longer the Groupon deal will be available but if you can take advantage of that, don't forget to sign in through eBates and pick up an additional 6% cash back.